MOTIONGATE Dubai, the Hollywood-inspired theme park and official home of The Smurfs in the UAE, this week hosted the Middle East premiere of The Smurfs’ latest movie, Smurfs: The Lost Village. 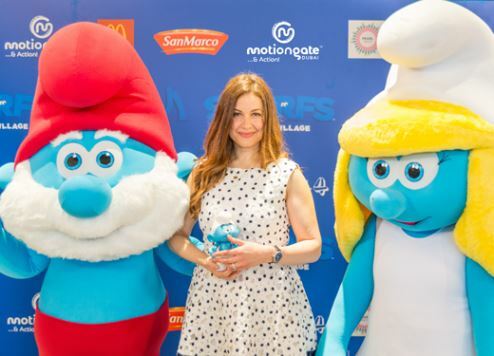 The theme park, which is part of Dubai Parks and Resorts, rolled out the blue carpet for Papa Smurf, Smurfette, Brainy and Vanity, who were joined by television personality, Raya Abirached, the Arabic voice of Smurf Willow in the new movie. The premiere was held at the theme park’s 1,000-seat Hollywood Theatre and was followed by Raya joining her blue friends for a tour of their mushroom-capped homes in the Smurfs Village, one of five theme zones at MOTIONGATE Dubai. “MOTIONGATE Dubai combines the best of Hollywood cinema, theme parks and live entertainment, which is why it was only fitting that the first premiere for one of our most well-known and loved characters The Smurfs, was hosted at our very own Hollywood Theatre,” said Brian Machamer, the theme park’s general manager. The Smurfs Village Zone, which opened to the public last December, is the largest Smurfs-inspired theme park zone in the world. Parents and kids can go beyond the screen and step into the fantastical world of The Smurfs with its larger-than-life mushroom-capped houses and lush forested surroundings. The resident Smurfs mingle with visitors as they explore the variety of rides, live shows, play areas and dining options. Highlights include the Smurfs Studios Tour, an interactive ride, which takes guests behind the scenes of the Smurfs movie set; Smurfs Village Playhouse, a one-of-a-kind theatre show where kids can interact with an animated Brainy Smurf and indulge in a two-way conversation; the SmurfBerry Factory, a soft-play area filled with foam Smurfberries; Woodland Play Park, an outdoor adventure and exploratory play area with rope bridges and climbing areas; and the Smurf Village Express, which is the world’s first Smurf-inspired rollercoaster.